Disney’s been working through its back catalog of animated films, releasing them one-by-one onto Blu-ray, many presented at home for the first time ever in high definition. The most beloved are receiving special treatments, often dubbed Diamond Editions, with exciting new bonus features packed into multi-disc releases. But that’s not the case for all of Disney’s new-to-Blu-ray films, as the less popular (or, at least, less marketed) ones are being pushed onto shelves with little more than the films themselves. Such is the case for three of Disney’s animated works that made it onto Blu-ray last week. “The Hunchback of Notre Dame” is one of Disney’s most underrated films, a masterpiece in art style and musicality. Beginning instantly with the grand opening notes that lead off the film and Alan Menken’s unforgettable soundtrack, this film is beautifully presented in its new format. The attention to detail across this film’s characters and backgrounds is staggering and its music earns a place in history alongside some of the greatest musical theater ever produced. On Blu-ray, “The Hunchback of Notre Dame” has never looked or sounded better. However, by contrast on the same disc, its direct-to-video sequel is downright awful in every respect. After playing the original and sequel back-to-back, it’s immediately obvious how poor the second film looks, sounds, and plays out. With sloppy animation, “Hunchback II” looks more like an ’80s Saturday morning cartoon than a feature-length Disney film. It’s worth skipping entirely. 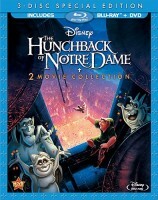 There are no new bonus features to be found on this release, but fans of “The Hunchback of Notre Dame” shouldn’t let that stop them from picking this title up, as it’s worth the purchase just for the wonderful quality of the original film. Though “Mulan” is liked by many, it’s never quite found its way into the hearts of the masses in the same ways that other Disney princess films have. But Mulan isn’t your average Disney princess, taking troubles into her own hands instead of waiting for a prince to save her. It’s a story of empowerment that’s enjoyable and certainly memorable, even if time tends to forget it in the shadows of Disney’s greats like “Cinderella” and “Sleeping Beauty.” On Blu-ray, “Mulan” looks good but also shows its unfortunate art decisions all too well. The film plays quite flat, with only simple gradients used to illustrate shading and shadows. After watching “Hunchback,” the difference in level of detail is obvious. It’s an entirely different art style that helped begin Disney’s movement into the “Lilo and Stitch” era of animation. But like “Hunchback,” the direct-to-video sequel to “Mulan” isn’t anything worth watching, immediately noticeable as a throwaway story as soon as it’s revealed that it surrounds the notion of Mulan getting married. Also, Eddie Murphy’s voice is absent, an important piece of the comedic puzzle from the original. And, again, no new bonus features are included, instead only recycling old ones from previous DVD releases. 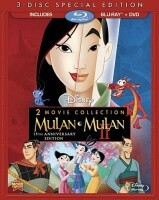 This Blu-ray release offers little to get excited about and owners of past “Mulan” DVDs may want to just stick to those. “Brother Bear” was part of the temporary demise of Disney’s hand drawn animation units. It was the last film to be animated at the then Disney-MGM Studios in Florida before that studio was shut down. And it never received much critical or fan acclaim. 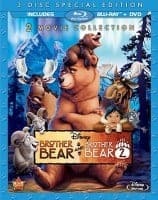 But those dark marks aside, “Brother Bear” is actually a good looking film, especially now presented on Blu-ray. The film itself is not great, but its vibrant colors make give a great “wow” factor to high definition displays. It’s worth noting that this Blu-ray release is presented in the film’s original aspect ratios, beginning smaller at 1:78-1, widening to 2:33-1 after 24 minutes. That leaves the first several scenes looking rather tiny, surrounded by black bars on all sides, even on 16×9 widescreen TVs. This is surely to confuse those who don’t understand the concept of aspect ratios, but it is an artistic decision made by the film’s director, widening the scope of the visuals when the movie’s big “transformation” takes place. “Brother Bear 2” looks strikingly like the original, release direct-to-video a couple years after. But it’s not particularly memorable. Like the others above, this Blu-ray release again does not contain any new bonus features, only inheriting those from previous DVDs. “Brother Bear” is worth a watch, but is not necessarily a must-have. All three releases are available now from Disney at major retailers on Blu-ray. All three of these are fantastic releases. Yes. They are simple not offer a lot but they remain great. I recently interviewed Dave THomas from Brother Bear and Paul Kandel from Hunchback and they personally were excited for these films to finally be getting HD release too. I have to agree with your assessment of “Hunchback 2”. The animation just isn’t up-to-par with anything I’m typically familiar with by Disney. I’ll still watch it some day, but I’ll probably be thinking the whole way through…what did they do to this movie??? Great blog here! Also your website liads up fast! What host are you using?